Fortunately, my intuition kicked in and I sensed that this was a place that catered to its customers. I asked our server if he could, “sub out” the rice for another vegetable. His suggestion was fantastic. Sub- spinach! As it turns out, this newly minted creation was friggen’ phenomenal! Red onions, check; zucchini, check; yellow squash, check; carrots, check; diced garlic, check; steamed spinach, check, tastebud fiesta, check! 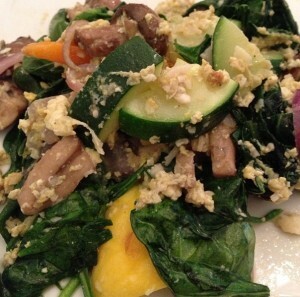 This entry was posted in Uncategorized and tagged carrots, garlic, red onions, spinach, squash, zucchini. Bookmark the permalink.